Massachusetts - Building the Largest Travel Time Network in the U.S.
SES America, Inc. (SESA) has completed the manufacturing of over three hundred (300) solar-powered embedded dynamic message signs to be installed as part of the Massachusetts Department of Transportation’s “Go Time” project. Once completed, the project will provide the largest travel time network available in any state in the U.S., allowing motorists across the Commonwealth to instantly access travel time data on major corridors across the region. SESA designed, engineered and manufactured each DMS to be utilized specifically for the solar applications required under the project, with energy efficiency that sets a new standard for the DMS industry. The end product provides all the functionality and reliability of non-solar powered DMS, while minimizing the size and expense of the solar power system – providing over four weeks of autonomy. Each site consists of static sign panels with pre-determined destinations and travel time data for each destination displayed on DMS embedded within the static sign. The sites also contain Bluetooth readers for data collection, as well as wireless modems to send and receive the collected travel time data wirelessly. The entire system is installed without the need for trenching and conduits to carry power and data cabling. All components are powered from a single solar power system at each site, utilizing multiple photovoltaic panels and a battery bank enclosed in an insulated cabinet to protect the batteries from heat and cold. 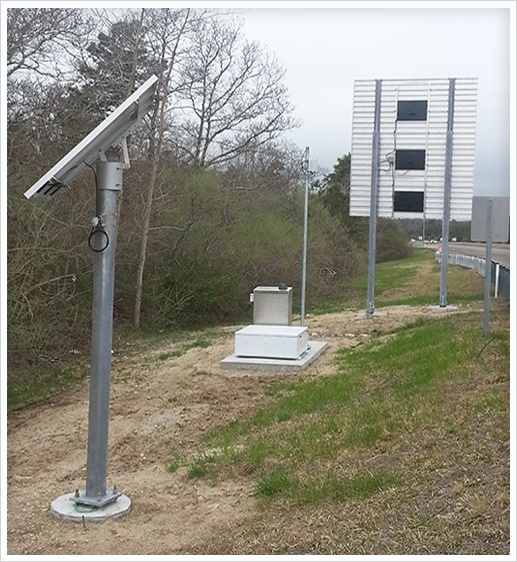 SES America engineers designed and calculated the entire solar systems for each location which was then approved by Jacobs Engineering and MassDOT. Installations began in February of 2016 and will continue throughout the Summer of 2016, with estimated completion of the entire system later this year. All aspects of the design were optimized to improve energy efficiency and cost effectiveness.